Steven Gitelis, MD was honored as a Top Doctor in Chicago by the International Association of Orthopedic Surgeons in 2017. CHICAGO, IL, October 02, 2018 — Marquis Who's Who, the world's premier publisher of biographical profiles, is proud to present Steven Gitelis, MD, with the Albert Nelson Marquis Lifetime Achievement Award. An accomplished listee, Dr. Gitelis celebrates many years' experience in his professional network, and has been noted for achievements, leadership qualities, and the credentials and successes he has accrued in his field. As in all Marquis Who's Who biographical volumes, individuals profiled are selected on the basis of current reference value. Factors such as position, noteworthy accomplishments, visibility, and prominence in a field are all taken into account during the selection process. Since 1996, Dr. Gitelis has held an endowed professorship in orthopedic oncology at Rush University. He also currently holds the title of associate chief medical officer of surgery, and from 2013 to 2017, acted as associate dean of surgery, chief of surgery and associate chief medical officer. His career at Rush University extends over 35 years, having held a number of other professorships and associate and assistant professorships. He has also served as senior attendee at the Rush-Presbyterian-St. Luke's Medical Center (now recognized as the Rush University Medical Center) since 1990, and as the director of the Center's section of orthopedic oncology since 1984. His work in academia extends beyond his position at Rush University, as Dr. Gitelis also currently serves as a lecturer in orthopedics at the College of Medicine at the University of Illinois, a position he has held since 1986. Additionally, he served as associate attendee at Rush-Presbyterian-St. Luke's Medical Center from 1982 to 1990 and assistant attendee from 1982 to 1986. Dr. Gitelis currently serves as a member of the Faculty Advisory Committee at Rush University and as chairman of the Surgical Services Executive Committee. He was also was recently elected Chairman of the Twentieth Century Orthopedic Association. Over the course of his career at the university, he acted on numerous search committees regarding student affairs, faculty appointments, research, medical and surgical quality, and bylaws. He is past president of medical staff at Rush University, and past president of The Rush Surgical Society and the Musculoskeletal Tumor Society. 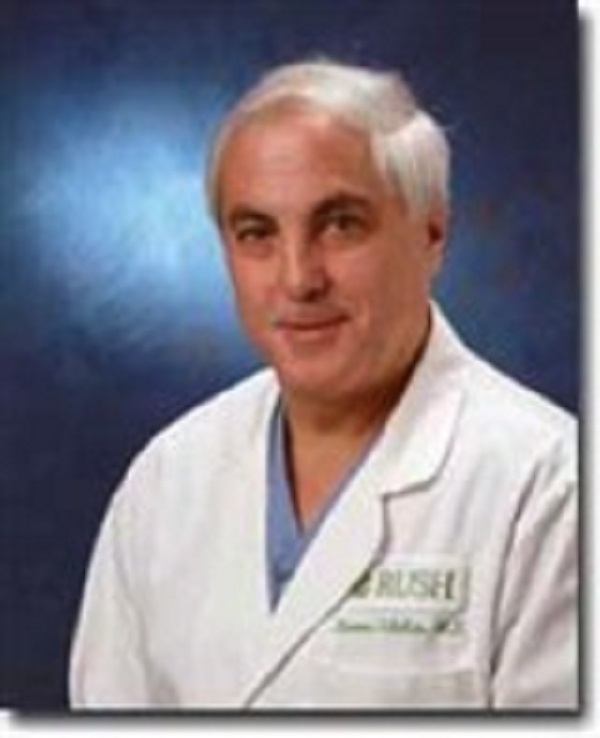 Dr. Gitelis is a past trustee of Rush University and former trustee of the Gift of Hope; he has served the Gift of Hope as the director of the Bone and Tissue Bank since 1982. Dr. Gitelis graduated with a Doctor of Medicine from Rush University and received a Bachelor of Science, with high honors, from the University of Illinois. After graduating, he continued his medical education as an intern in general surgery at the Rush-Presbyterian-St. Luke's Medical Center and completed his residency at the hospital in 1980. He then acted as a fellow in orthopedic oncology with the Mayo Foundation for Medical Education and Research and as a fellow in orthopedic surgery at the Università di Bologna. Dr. Gitelis is editor emeritus of the Rush Orthopaedic Journal and previously acted as consultant reviewer of the Journal of Pediatric Orthopedics, the Journal of Bone and Joint Surgery, CORR and the Journal of the American Academy of Orthopaedic Surgeons. He also acted as former associate editor of the National Strength and Conditioning Journal. He has published more than 100 articles in professional journals, chapters in books, and has presented at conferences around the world. He is an active member of numerous organizations, including the American College of Surgeons, the American Academy of Orthopaedic Surgeons, the Musculoskeletal Council of the American Association of Tissue Banks, the Pediatric Oncology Group, the Children's Cancer Study Group, the American Academy of Orthopaedic Surgeons, the Twentieth Century Orthopaedic Association and the American College of Surgeons. He is also past president of the Musculoskeletal Tumor Society and the Illinois Orthopaedic Society, and former member of dozens of other associations. Dr. Gitelis was the recent recipient of the ICARE Achievement Award by Rush University in 2017, the Steven Gitelis MD Inspiration Award by AlloSource in 2017, and was honored as a Top Doctor in Chicago by the International Association of Orthopedic Surgeons in 2017. He was also the recipient of the Patients' Choice Award in 2012, the Golden Apple Teaching Award by the Department of Orthopedic Surgery at Rush University in 2004, and the Clinton Compere—MD Outstanding Presentation Award by the Twentieth Century Orthopaedic Association in 2000, among many others. He was inducted into the Zeta Chapter of Illinois of the Alpha Omega Alpha Honor Medical Society in 2002. In the past 20 years, Dr. Gitelis was also listed in dozens of publications for his position as a top doctor for cancer and orthopaedic medicine, including Chicago Magazine, the Castle Connolly Medical Ltd, Newsweek, U.S. News & World Report L.P. (top 1 percent of doctors), Best Doctors Magazine, America's Top Orthopedists in Consumers' Research Council of America, and Strathmore's Who's Who. Dr. Gitelis is married to Mary Gitelis. They have five children: Marc, Sarah, Samantha, Matthew and Sydney. Aside from the contributions he made throughout his career, he also served his country as a veteran of the United States Naval Reserve; he served as a commander from 1990 to 1997, as an active member of the National Naval Medical Center from 1990 to 1991, and as lieutenant commander from 1989 to 1990. He also served his community as a volunteer with the American Red Cross and as an Oakbrook little league baseball coach. In recognition of outstanding contributions to his profession and the Marquis Who's Who community, Dr. Gitelis has been featured on the Albert Nelson Marquis Lifetime Achievement website. Please visit www.ltachievers.com for more information about this honor.